← Krispy Kreme Baked Creations: All Hail Bacon! Two words. Chocolate tasting. How can anyone resist such a promising invitation? The latest brainchild of Cuillere Chef Katrina Kuhn-Alcantara, Paulene Chocolats Suisses takes the finest Swiss chocolates and marries it with techniques acquired from famous international culinary institutes. The actual production is then done locally, using imported ingredients, creating high quality hand-crafted chocolates at a very competitive price. 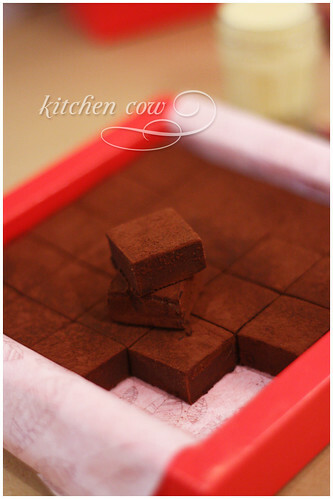 We started the evening off with ganache, a chocolate and cream confection that’s set in trays and cut into squares. 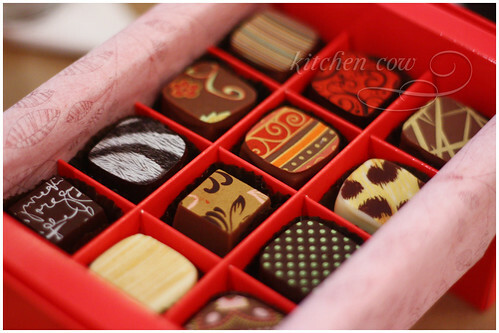 Paulene’s ganache comes in a variety of flavors to satisfy everyone’s chocolate cravings. From the creamy milk, the light white, to the stronger chocolates like dark and grand cru. They also have flavored variants like gianduja and orange liquer. Call me a Philistine but I was never one for dark chocolate. I always found it a bit too bitter for my tastes. But Paulene’s dark chocolates don’t have that acrid bitterness some commercial darks have. What you get is a very full chocolate flavor that coats the tongue. I’m sure you’re all thinking, “It looks like Royce Nama.” Frankly, that was my first thought as well. One can’t help but compare the two. Freshly opened Royce Nama Chocolate tends to be silkier on the tongue, melting as soon as it comes in contact. Paulene Ganache feels heavier and denser. It has a stronger chocolate flavor, a characteristic Chef Katrina Kuhn Alcantara attributes to the fact that they don’t add extra oil to extend the chocolate. What do I like better? Each brand has its own strengths. Paulene’s Gianduja tastes lovelier than Royce’s—the hazelnut flavor is more apparent. When it comes to milk / au lait, I like Royce’s better because of the extra kick the Grand Marnier infused into it has. This is really where personal preference comes in. Truffles! Choose your own sin. 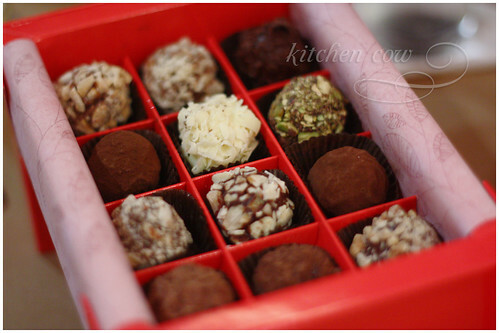 Closely related to the ganache are the hand-made truffles. These hand-rolled balls have the same basic chocolate varieties as the ganache, with the addition of chopped nuts or grated chocolate coatings and fillings for added depth in flavor and texture. The ones with nuts are particularly lovely. You can’t go wrong with macadamia or pistachio, can you? What really caught my eye that evening were the Pralines. These dainty detailed confections were either dipped or filled, depending on the center’s consistency. Finished off with colorful, artsy designs, it was a feast for the eyes. Truly, they were too pretty to eat. Each design corresponds to a different center, so if you’re not familiar with what’s inside, it can be an adventure of sorts. SO CUTE! If you’re courting a girl, this will get you plus points. The range of flavors is great—that evening, even my small table couldn’t agree on what flavors we liked the best. Ro couldn’t stop raving about the cinnamon-y apple pie, “complete with crust flavor.” Lauren enjoyed the refreshingly fruity raspberry. Melo detected a faint liqueur taste in the Mint, “the creme de menthe,” according to Pastry Chef Arnel. My personal favorite would be the Earl Grey, with its distinctive aroma that easily reminded me of fragrant milk tea, but the Coffee praline comes a close second. Aside from being cute and absolutely decadent, the Pralines are also excellent as a wedding favor or a corporate giveaway. They can do monograms and names on them. 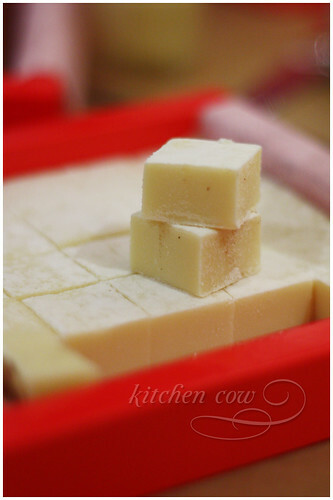 The only limitation is that it has to be printed on white chocolate, but as to the filling, you’re free to choose. Looking for something unique? Be among the first brides to give this away. Right now, the ganache, truffles and pralines are sold prepacked, but Chef Katrina shares that they may allow a pick-your-own flavors tray in the future. Trays are packed in insulated foil pouches with gel ice. 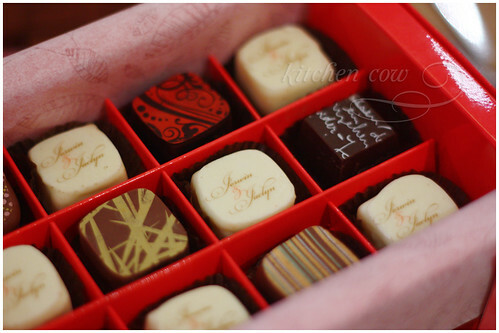 The boxes are perfect for gift giving, with the truffle and praline box covers turning into a stand for easier serving. Paulene Chocolats Suisses is available at Cuillere in Serendra, Blue Kitchen and Santis. Grab your friends, then grab a box for your own chocolate tasting party. This entry was posted in food spotlight, restos & eateries and tagged arce, choco, chocolate, chocolats, cuillere, french, ganache, handmade, high-end, katrina kuhn alcantara, praline, quality, suisses, swiss, truffle. Bookmark the permalink. looks super yummy!!!! i hate that i’m not supposed to have chocolates for an extended period of time (doctor’s orders) but i’ll make it a point to pick up a few boxes once i get clearance. Thanks for the post! 500 or so? Close to Royce. Not sure if the prices are on their website but I have their flyer. I’ll check when I get home. The pralines are so pretty! I can say goodbye to my diet and go after these. But sadly my wallet will not allow it. (T^T) But those chocolates look soooo good. Looks too pretty to eat but it’s too nyummy not to eat. Mebbe split a box with some friends. So you can have a taste to satisfy the want, but not enough to do damage to your diet and wallet. My brother brought home two boxes of these babies. They were soooo good! What sort did he bring home? I like the Earl Grey praline best.